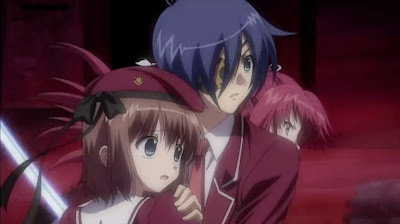 I Blog Anime: 11 Eyes: Chaos; Head Clone? This concerns me quite a bit because Chaos; Head started well, but it had turned out to be a much worse anime. And this, 11 Eyes, already has a somewhat unimpressive start, I wouldn't want to image what it will eventually become. For time being, I'll hang on to it, but I don't think I can see it to the end. Your research is wrong Chaos Head is an eroge developed by Nitro+ while 11 eyes is an eroge developed by Lass. I also don't see how Chaos Head and this are related at all. Ok, yeah, I guess I was looking at the publisher instead of developer. I'm not saying they're related, I'm just saying that lots of things in 11 Eyes resemble things from Chaos; Head, especially things I don't like.